The machine is CE certified and comes with 1 years free warranty. 1.This swing-away 12" X 10" (30 X 23cm) heat press machine could transfer photos, words on cotton, fiber, metal, ceramic, glass and so on, suitable for producing gift, advertisement and so on. 2.It can be able to apply transfers, letters, numbers and images onto T-shirts, garments, bags, mouse mats, jigsaw puzzles, ceramic tiles, plates and other flat surfaced items. 3.The Machine has a built-in Teflon coated 12" x 10" heat platen with a full range of heating coils to allow for consistency throughout its surface. 4.Its unique swing-away feature allows you to rotate the upper heat platen 360 degrees around. 5.By moving the heating element aside and reducing the chance of accidentally contacting the area of heat distribution, you can work more freely with your garments and transfers on the base plate. 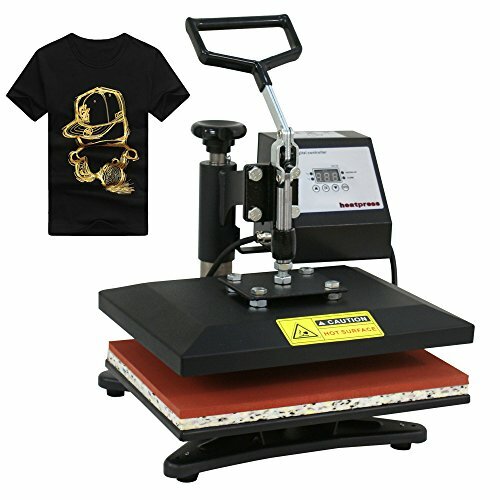 6.Unlike the traditional clamshell heat press machines, the heat transfer applies direct top-to-bottom pressure providing even contact with the surface below. 7.The digital timer control is adjustable up to 999 seconds. 8.The Machine also features a digital temperature gauge ranging from 0 - 200ºC (about 400ºF). 9.The manual open and close handle is easy to operate and can be adjusted with the pressure knob at the rear of the machine. Good in applying transfers, letters, numbers and images onto T-shirts, garments, bags, mouse mats, jigsaw puzzles, ceramic tiles,plates and other flat surfaced items. It can transfer photos, words on cotton, fiber, metal, ceramic, glass and so on, suitable for producing gift, advertisement and so on.